It always makes me a happy person when I serve my guests/friends in style. This is important for me to put up the right table décor while I’m having people visiting us. Because we usually gather around the table to chat & eat. My friends hardly spend their time in the living room when they visit my home, because they get attracted more towards the food. So, they like the dining room more where they being pampered with warm food which comes straight from the kitchen. I always look out for great serve wares, and it has become a necessity now because I host parties quite frequently at my home. I prefer to collect different style of serve wares so that I don’t have to repeat them on the table. I was recently introduced to Nestasia. They’re into home décor with a striking range of Serve wares, Kitchen storage products, Décor items etc. Their macramé collection is one of kind. I’m planning to get one for my home. It’s impressive to see that they’re collecting all their artisanal products from neighbourhood countries like Cambodia, Vietnam, Indonesia, Malaysia, Thailand, Philippines to name a few. This way the local crafts of these countries are reaching to new patrons. Every handicraft seeks global audience which is important to value craftsmanship. 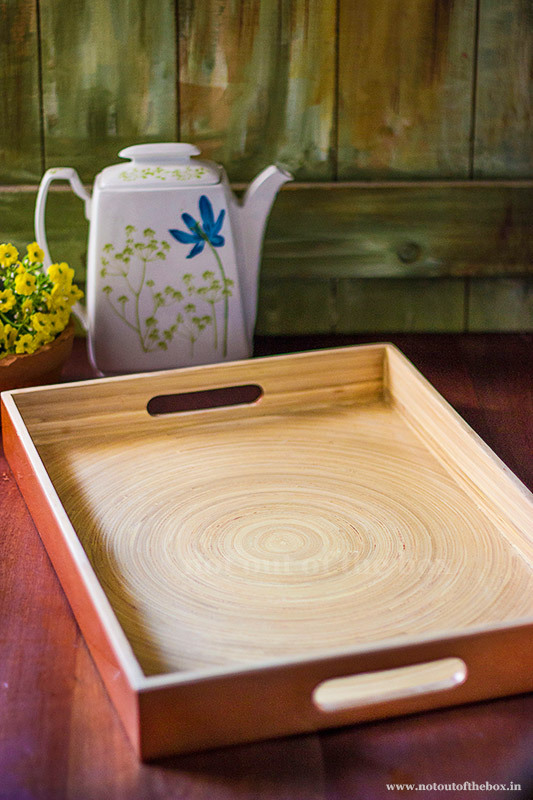 Nestasia sent me a gorgeous Bamboo tray from their wide range of tray collection (they’re having near about 20 tray varieties). The tray which I’ve received is not only intended for special occasions, but one can use it every day. It’s a sturdy, rectangular tray with a stunning metallic copper rim. The base is also made with the same material. The inside of the tray is intricately designed with all-natural bamboo fibre which ensures a non-reactive surface for any food. It’s a capacious tray. And there was space left after putting 1 quarter plate, 2 mugs and a tea kettle. So, yes, you can serve a couple of teacups & snacks all in the same tray. 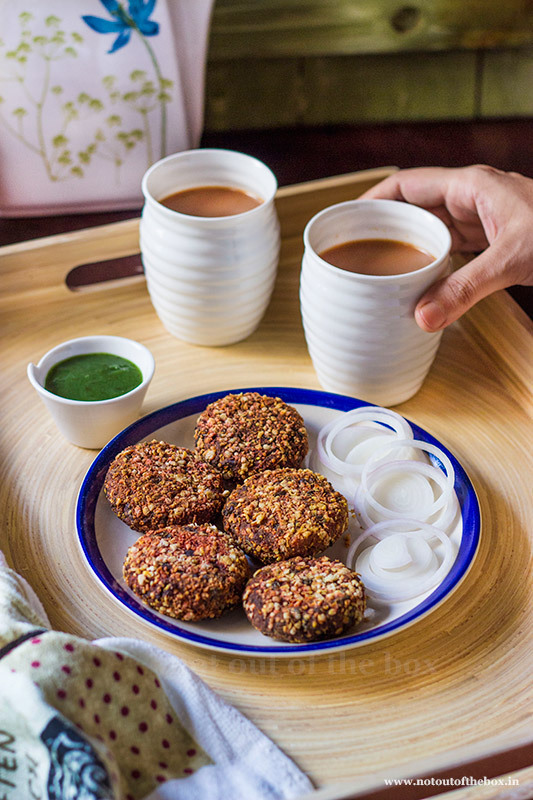 You can get an idea from the picture below how I served the Cutlets and Chai on the tray. 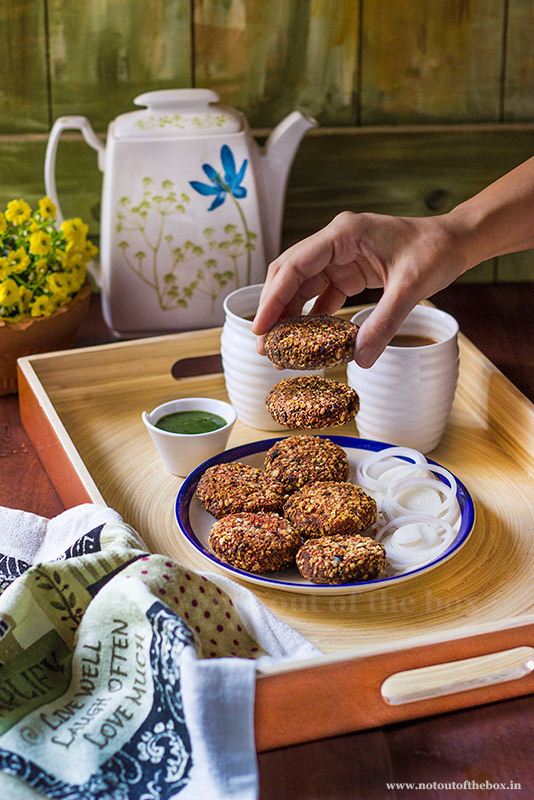 Coming to the Oats Vegetable Cutlets, these are healthy, kid-friendly snack made with vegetables and coated with oats to make them gluten-free. Some old family friends visited us recently, and they were preferring gluten-free, vegetarian food. Especially for my friend’s husband who was diagnosed with gluten intolerance a few months back. So, I made the cutlets without breadcrumb coating and cooked them in Air Fryer. This way I could avoid the deep frying part of the food. The cutlets were finished within no time, and I was being repeatedly questioned why I didn’t make a large batch, my bad, I promised them next time I’ll do it again. Before I make several batches of this again why don’t you try and make some? I’ve included oven baked method also in this recipe. Peel & cut Carrots and Beetroots into cubes. Pressure cook them with enough water and take off from the heat after 4 whistles. Open the lid after the pressure has reduced, discard the water or you can add this while making dal. Let the carrots and beetroot cubes cool completely. Now add them into a food processor and blitz until a coarse mixture forms, keep aside. Heat oil in a frying pan, temper with cumin seeds. Next to add garlic paste, sauté for a few seconds. Add carrot+beetroot mixture, boiled french beans, ginger paste, cumin powder, coriander powder, chopped green chillies, black pepper powder, and salt. Mix well, cook over medium heat for 5-6 minutes, and keep stirring in between. Add mashed potatoes, sugar, roasted cumin seeds powder, and garam masala powder. Mix well, and cook until the vegetable mixture dries up a bit and leaves the edges of the pan. Remove from the heat and transfer the vegetable mixture on a plate. Let the mixture cools a bit. Now grease your palms with little oil and start making ¼” thick round cutlets. After making all the cutlets coat them with instant oats. You cannot roll the cutlets over oats, as they’re thicker than breadcrumbs. Pat the oats gently over the cutlets and press a little, so that the moist surface of the cutlets hold up the oats well. Wrap the plate of the cutlets with cling film and keep refrigerated for 1 hour before you bake them. Brush the bottom of air fryer basket with oil. Preheat air fryer to 180C for 5 minutes. Arrange the cutlets into the basket. Bake for 24 minutes or until crisp from the outside. Stop the Air fryer to flip the cutlets in between. When done, remove the cutlets from the air fryer basket. Preheat oven to 180 degrees C. Line a baking tray with butter paper or aluminium foil. If using foil grease the top with oil after lining. Place the cutlets onto the tray and bake for 24 minutes or until crisp from the outside. Flip the cutlets in between. 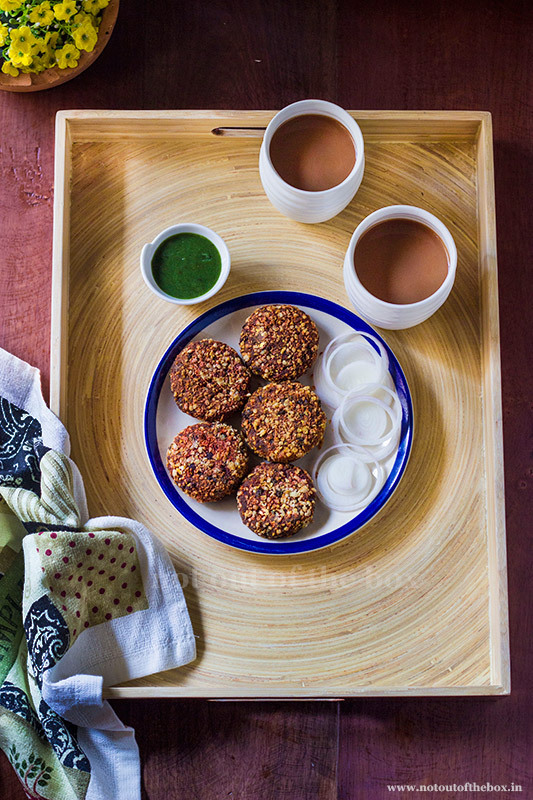 Serve immediately with green chutney or tomato sauce. And don’t forget to pair it with hot Chai on the side. Enjoy! I’ve not fried these cutlets. So, not including that step into the recipe. If I fry them anytime soon, I’ll definitely add the step here. These are freezer friendly cutlets. You can make them in large batches and store the uncooked cutlets in zip lock pouches. Consume within a month or two. Just take them out from the freezer 10 minutes prior before Baking/Air Frying.